Perhaps you stumbled across a new and conspicuous Vanity Fair spread today. You know, the one featuring a photograph of all of the current late-night television hosts. You might even have noticed a striking similarity uniting said hosts. If you look closely, you’ll see that—I know this is a surprise—they’re ALL male! 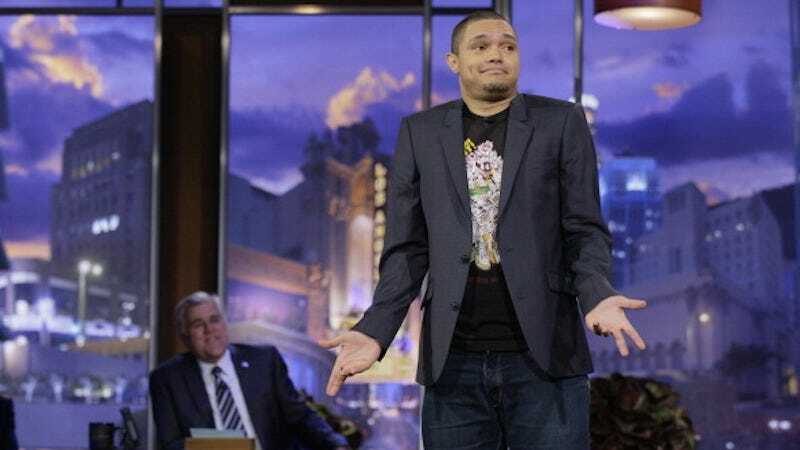 But Trevor Noah, the new host of The Daily Show, urges us not to worry. As far as he’s concerned, women hold the brunt of the power in comedy. “I don’t agree with the notion that there are no women in comedy,” Noah tells Newsweek on September 14. But hey, late night television only represents one division of comedy. “I would...argue that women are more powerful in comedy right now,” continues Noah. He proceeds, “If you look at the top comedy actors, Melissa McCarthy by far is killing the numbers of other actors. You look at Amy Schumer right now—I would argue that there is no more preeminent voice in comedy. Tina Fey, Amy Poehler, their movies coming out...” I assume that, at this point, Noah’s voice trailed off as he basked in his delusions of equal representation. Vanity Fair introduces its article on “the titans of late night” with the ludicrously blinkered headline, “Why Late-Night Television Is Better than Ever.” A photograph of the late-night hosts, “clutching whiskeys and decked-out in Mad Men-style garb” immediately follows. The title and photo concept alone do not, to say the least, inspire confidence. Your heart is in the right place, Trevor Noah. Your complacency, however, is part of the problem.